Eastern Market Corporation in Detroit interviewed by Romy on location! Learn about one of the oldest open-air farm markets in the United States and discover the grand plans for the expansion of food entrepreneurialism from start to scale! Romy speaks with Christine Quane about the history and expansion efforts that will sustainably serve a community! Romy: Welcome to another episode of Bonfires of Social Enterprise. This is Romy and today we will be listening to my interview with Christine Quane of the Eastern Market Corporation. 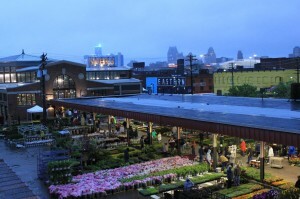 The Eastern Market is one of the oldest open-air farm markets in the United States. Actually, it may be the oldest, but it’s so much more than that. They’ve been incredibly innovative and observant to the needs of the neighborhood and the entrepreneurial vendors that set up shop there. As you will learn they’re building out and entire food business ecosystem that will really help the food entrepreneurs move from concept to micro-business and then all the way through into scale. Let’s begin with our fun fuel for this episode. Jentzen: Hey guys, this is Jentzen and here is your fun fact for this episode. 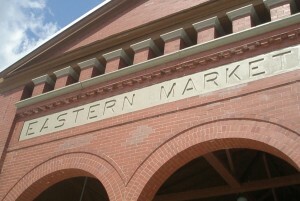 The Eastern Market is well known for collaboration and trade of food and beverage products. I found this historical collaboration on wine. The act of cultivating wine involved the Mediterranean people from Barbarism due to the fact that they began to use barrels and bottles for the first time. They also began to work together with each other to find ways to ship and trade wine. This is how wine came to be in France. In the nineteenth century, almost all wine vines in France were destroyed by a disease called Phylloxera, which sucked the juices out of the wine vines. Soon after it was discovered that American vines were immune to Phylloxera, so the French obtained wine vines from America and began to make a hybrid wine with the remaining French vines that had survived. This is the wine that forevermore comes out of France. Romy: As I listen to that fun fuel story, I’m amazed at how some products and services come to be. It’s so funny, we forget. There’s always some sort of collaboration in there. Please meet Christine from the Eastern Market Corporation. Know that because this place was so booming and busting we had to go all the way downstairs and find a cellar area to do the interview so you’ll hear a little bit of an echo, but it’s just part of being on the scene in Detroit. I’m sitting here with Christine Quane of the Eastern Market Corporation, and I’m really excited to have Christine she is such a great spokesperson for the Eastern Market. She has helped us so many times here. This conversation is so rich it’s almost going to be hard to narrow it down. We’re going to have to come back for part two and three of the Eastern Market. 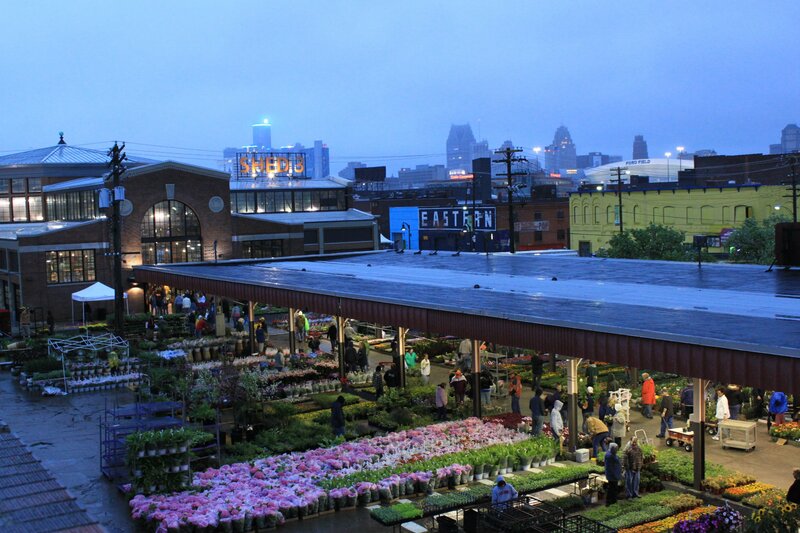 Today we want to give you listeners a feel of what the Eastern Market is in Detroit. It’s one of the oldest farm markets, as you’ll learn from Christine, and they’re doing some really cool things in exploring business and moving it forward. Christine, will you start by giving our listeners a real broad view of what the Eastern Market even is? Christine: The Eastern Market, we are going to be celebrating our 125th year, this year. We like to say that we are the oldest and largest public market in the country. We might share that title with one or two others, but we don’t know about them, so I think that we are the oldest and largest coming up to 125 years. A brief history of this place, the market was run out of the city of Detroit’s Park and Rec department up until about 2006. That’s when the non-profit Eastern Market Corporation was formed. We signed a management agreement with the city of Detroit to be the [market 00:03:52] operations of the market. Since that time, we have leveraged this place to foundations, to other corporations, and other sponsors that have helped us rebuild and renovate the structures of the sheds in the area. We were signed on by the city to manage the operations and to renovate the property, and we’ve done that. What my boss and President Dan Carmody has realized is that this place is so special that we could be doing so much more in the food sector. He is a visionary, a creative man who got the attention of a lot of the Kellogg Foundation, [Karski 00:04:34] Foundation, of others to support different ways that we could leverage this place to increase food access, to increase economic development. THat’s what we’ve been doing since he got here in 2007. It’s an exciting place; we’re changing all the time. We’ve moved much more than just renovating sheds and managing market operations. Although, that’s the bulk of who we are, we have gotten into a lot of other things. Romy: How big, Christine, is the layout of the place? Our listeners can probably hear; we’re down in a basement setting right now to try to find a quiet cubby to talk because this place is bustling with activity. If we go upstairs, what is the acreage of this? Some of it’s open, and some of it’s being renovated, right? Christine: Right. The campus itself is about 14 acres. I think it’s five acres of sell-able space under five structures we call sheds. We have two of those shed buildings are indoors, and the other are open air. Between our two closed sheds, shed three and shed five, is shed four. That structure was built in the 1940’s during World War II and our next project. We hope to enclose that shed, make it open air in the nicer months but be able to be closed during the winter months as it is the main connector between our two other sheds. It will be a market hall. Above that, we looked at about 40 living spaces on top of the market. It’s a very exciting project, and that’s something that we hope to be starting in the next 18-24 months. Romy: Would that be food vendors staying in there primarily? Christine: It would operate just like our other market sheds on the main floor and then it would be mixed use residential housing above. It will be interesting to see 40 different units smack dab in the middle of a market that can attract anywhere between 50-100,000 people. On a flower day weekend to 40-50 in the height of a summer day here. I think there are probably at least 40 households that would want this experience. It’ll be crazy, but it’ll be great. Romy: This is such a destination place. I’ve spent the last 25 years in the Detroit area. Even before that, you hear about the Eastern Market from everywhere. It’s iconic and people from the suburbs and hours away, for those of you who don’t live near Detroit, will travel down on weekends. Let’s talk about some of the histories before we go the future and what’s happening now. We know restaurateurs will come down and chefs, very early, meet deliveries. Will you give the listeners a flavor of some of that? Christine: Eastern Market is multiple markets. The main market that the Eastern Market was founded on is our wholesale market. That runs between midnight and 6 AM, five days a week during the growing season. The growing season for the state of Michigan, for fruits and vegetables, starts around Father’s Day and goes to the end of November. With the warmer weather, we’ve had growers that’ve been here up until for first or second week of December still selling a product. The history of the market, farmers from all over the Southeast, Michigan, Ohio, Canada, would bring their goods to Detroit. They would come to the market, jobbers, they called them back then, would set up shops around Eastern Market that then buy from these farmers and then distribute horse and buggy, then eventually in cars and then in trucks, to the neighboring places. Whatever was left over for the end of the week was then open to the public on Saturday. That’s how our Saturday market started. Over the advent of distribution centers, and for grocery and retail, we have seen our wholesale market and the viability of that shrink a little bit as we have been on the outside of supply chains for retail and grocery. However, one of the things that make us really unique here, in Southeast Michigan, is that we do still have a great number of independent retailers that the reason they’re here is because of Eastern Market, and the reason Eastern Market still exists is because of them. It’s a very symbiotic relationship. We like to say, here at the market, that we’ve all been eating local, before eating local was cool, because these retail grocery stores bought this product because it had an incredible shelf life, it had just been harvested the day before, higher quality as far as taste and flavor and yield. They knew they had a superior product. Nobody really valued, at that time, that it was local or regional or what it did to the economy. It was just a better product. With being able to differentiate their stores on high quality produce allowed them to stay in business over the years. There’s a big difference between apples that are coming over in a truck over the Rocky Mountains versus ones that are grown here in Michigan. As far as shelf life and value and flavor. That’s why we continue to have a market here and the wholesale market. That continues to be a premium. Now as we move into featuring farmers, and farmers are rock stars now, we had to see the demand for local food in the retail establishment has even been growing over the years. It’s a trend that’s not going away. When I say it’s trend, its not fad in the sense that people are getting burnt out, it just continues to grow. That’s our wholesale market. Our Saturday market is 52 weeks a year, so we’re here every Saturday in the winter as well. We condense down into two sheds, but we do still have a great array of actual produce that is here. Some of it are things that are grown in greenhouses, in Leamington in Canada and things that are grown in greenhouses here in Michigan. A lot of it, too, is coming from dealers that are buying on the world market. This is a public market, not a farmers market. It’s an access point for fruits and vegetables for the city of Detroit. It very important that we still have lemons and limes and bananas for folks as well as produce all year around. We do have that, and it continues to go. We also added, in 2011, a Tuesday market, which is like a smaller, scaled down version of our Saturday. It’s mostly in shed two. It’s a great open air market. We do a lot of fun programming on Tuesdays to attract people down here. It’s a fun market. We also launched a Sunday market. We just finished up our second year of our Sunday market. We like to think of Sunday market as, if Saturday is food with a little bit of stuff, Sunday is stuff with a little bit of food. It’s Artisans. It’s your soaps and your fun stuff like that. We do a lot of fun programming, too, on Sunday. That market is growing year over year. We have the Derby Girls that come out. We have all sorts of fun things on Sundays. We have our infamous Flower Day weekend, which attracts over 100,000 people. Which is a crazy event, but that’s super fun. It’s part of so many people in Southeast Michigan’s tradition to come down here for that day. It’s just what they do. Moms, grandmothers, it’s just a big family event, and everybody comes down it’s a point of tradition. It’s the kickoff to their summer. Romy: It’s so beautiful too. It’s so beautiful to see that vibrancy of colors and the smells. It’s amazing. Christine: Probably my favorite Flower Day moment is just when the sun rises because we’re here at 5:00 in the morning, to see the sunrise and the sheds explode in color is incredible. Just to see the vibrancy of everything and everyone. It just starts to come alive in those early morning hours. That’s my favorite time. Romy: How many core employees and staff do you have, just within the Eastern Market, to pull of what you’ve said so far? Christine: We have around 18 full-time staff members and then we have our customer service support team, they’re our security force and customer service support. We have about 10-15 of those guys as well. One of the things that’s really important for people to understand is that it’s very safe here. We have a lot of folks that are walking around that keep their eyes and ears open for any kind of trouble. If we’re here on a Saturday all of us have a radio; we’re all on the same frequency. We are constantly monitoring that. I don’t think this place would be busting with 60,000 people if it weren’t really safe. Romy: It’s melting pot if you come down here. It’s not just the employment that creates, but the Eastern Market is surrounded by blocks, almost a fence of business around it that also benefit from all the foot traffic. Christine: The market itself is about 14 acres, but the Eastern Market district is about 37 acres, and we are an authentic working food district in the city of Detroit. We’re at about 90% capacity of those food businesses. There are a lot of these produce houses that have been here for as long as the market has been here. Multi-generational produce houses that continue to distribute produce to restaurants and other retailers and food service outfits all over Michigan. We have Wigley’s Meats and corned beef manufacturers that have been making corned beef here for years and years. There’s a lot of interesting food businesses that are kind of under the radar here for years and years and years. They are growing and expanding. Their need for more land and their need to grow has begun to put a challenge on the Eastern Market because we like to maintain those food businesses here. If they go away, then the character of this place changes. We want to keep them in the Eastern Market District. We may want to move them just a little bit north of us, but we want to be able to back fill food businesses in those businesses places. We have about 25 food businesses that either want to come into Eastern Market or are looking for land to expand. It’s a great problem to have, but it’s a challenge that we’re working on right now. We just completed a stake holder analysis of the neighborhood for a strategic plan for 2025. We asked the residents and the businesses what they wanted to see for Eastern Market in the next 25 years. We want to keep it a working food district. We want it to grow. It’s an exciting place; it’s exciting places for business. We also just completed, for those of you not familiar, the Dequindre Cut is a rails-to-trails bike path that was expanded. It used to go from the Detroit riverfront all the way up to Gratiot Avenue. Now it runs alongside the east side of the market with an access point to the market. It’s a great path, and it improves accessibility to the market. It connects to Midtown, and it’s a great addition. That path is going to spur on more retail, more people who are going to want to live in this area, so we need to manage that for us. We want to make sure that it doesn’t become gentrified, it doesn’t lose it’s authenticity. These are things that we really are trying to make sure that we maintain a good solid balance going forward. Romy: One of the things that I noticed, the fundraising efforts and all the strategic growth around the Eastern Market, something that struck me so much is that you guys are acutely observant about what’s happening around you and paying attention. Not just capturing the information once and moving forward, but my sense is that there’s this ongoing paying attention. I see, we talked about this earlier, that you guys are not waiting to collect every possible piece of information before you take a step, you’re just going and gathering the information then. Christine: I would say that we’re like a 747, that we’re building as we’re flying. It is, it’s crazy. What we get to do, it’s a great job to have; we get to take chances. When we get a grant, it’s based on an idea that we think we’re going to be successful with, but we’re not 100% sure and that’s the beauty of a grant. We get to take these great chances to see if we can create a program that can work, that can sustain itself over the years. Considering that we continue to get these grants, from the state of Michigan, from the US government, they see that we’re actually being successful. They wouldn’t continue to grant us money if we didn’t do what we said we were going to do. It’s a great opportunity to learn, to make improvements. In some cases, it didn’t do what we thought it was going to do, but it ended up doing something unexpected and great and still worth while. Take our Farm Stamp program. We started that program as a food access program and a way to get produce into different neighborhoods. We call it our farm stamp or mobile pop-up market. In that program, we have about 20 sites that we visit in the summer. One-third of those sites are corporate sites, one-third of those sites are hospital sites, and one-third of those sites are neighborhood sites. That program started out of the back of my bosses Subaru and had migrated into three veggie vans, a bus hauling food all over Detroit into these 20 sites. We hire about 20, what we call, food and health fellows every season. We give them food safety instruction, how to merchandise, how to talk to people. We send them out into the public, and they are, just like we said, ambassadors. They are fresh food and health fellows, they are talking to people about eating fruits and vegetables, they are talking about how to prepare this type of food. We really noticed that from the hospitals, and for corporate sites, this is an employee wellness program. What they do is we ask them for a sponsorship every season. They happily provide that, and that offsets our labor costs and our ability to go into the neighborhoods. This program doesn’t sell hundreds and thousands of dollars worth of produce every year. We are moving the needle as in education and outreach. It is a great brand recognition. People like to see that Eastern Market is out and about, and it draws more people back to the market on Saturdays. So we’re looking at the possibility of going into some of these grocery stores that don’t have robust produce sections. Folks don’t usually go to those types of stores to get produce. We want to go into those stores, maybe one or two in the first year, set up a produce market, take the risk of owning the inventory, build sales for that grocery store overtime and then we can surrender over the sales and the whole program to that store. A lot of these smaller stores, they don’t know how to handle the perishability of produce, they don’t want to take the risk of having a bunch of produce and people not knowing that that’s a place to get it. That’ where we feel that Eastern Market can help because we can drive sales through our promotions, through our marketing and can be programming that can draw folks in. We can do things that can generate excitement around produce for that market and then build those sales up overtime and then go on to the next one. Leaving behind a produce operation for them. Romy: It’s like you’re incubating it for them with your expertise of creating a marketplace and your knowledge of produce. That’s powerful. Christine: That’s something we’re excited to do. Again, we are not grocery store operators. What we knew is that we wanted to be able to offer fresh produce more days than the market was open. What we knew was that there space available at Gratiot Central. We applied for a CED-HFFI grant, which is a healthy food an finance initiative with the US government. We’re awarded a grant that we then used that money to build out that space. It’s a new venture for us because Red Truck is not something that Eastern Market is the sole owner of. It’s a joint venture with community partners, and Red Truck is it’s entity. It’s also a work force development opportunity. We partnered with Goodwill Industries, who trained vets. We’ll be starting our second cohort of vets mid-February, they’ll be starting at the store. We’re pretty excited and proud about that. That’s Red Truck, and we’re doing all sorts of fun things we have planned for that. We have Sheffield Jones that is coming in every Saturday from ten until four. He’s doing live cooking demos, teaching folks about the seasonality of produce and health eating. We’re going to be having our urban growers come in and talk to folks about the importance of, not only buying from Detroit growers, but the importance of soil and the nutritional differences about produce that is close to you versus produce that came from who knows where. Getting people to understand quality and paying for that a little bit more upfront and being able to use that and be aware of food waste and how that affects our food costs. These are consumer education pieces that we really want to confront and talk to folks about. Talk to them through people that are growing their food. I think that we really want to make more of those connections for people that are living in the neighborhood, at least around here and in Detroit entirely. Romy: So far, this is so rich. I’ve got so many questions I want to ask you. You’re creating a marketplace, you’ve got all this education around nutrition and food waste, you’re teaching grocers how to do some of this building up their capacity and product lines and all the entrepreneurial pieces. How about the commercial kitchen? I know that story, would you mind telling us the story of the young lady and her husband with the popcorn. Christine: It took us a while to get shed five fully built, and we had grant dollars to build programming around our community kitchen. We didn’t have a community kitchen at the time for the programming. What we did was we went out into the neighborhoods and found two community sites, one a church and one a community center, that we could start having entrepreneurs go through. They were underutilized kitchen space that was licensed. Since we had two, we created a program, which we call Detroit Kitchen Connect. At that time, we did that in partnership with another organization called Food Lab Detroit. We launch these two kitchens. When our Eastern Market kitchen became online in 2015, it was the third kitchen in the Detroit Kitchen Connect network. We want to add more kitchens. The network is, we have around 18 or so entrepreneurs in the Eastern Market kitchen we have about five in St. Peters and Paul. The other kitchen was Matrix Human Services. That one didn’t so much work out for us. The timing and the availability of the kitchen space. We’re looking for others to add to that program. The entrepreneurs that have gone through our system, even so far, are quite incredible. There is Cynthia from Sha La Cynts, popcorn. Her husband was, I think, 300 pounds at one point. He had major health issues. Facing that, and their family facing that, she decided to change everything about the way they were eating. They became vegan, and she started creating this popcorn as a snack. She started putting things like kelp and kale and really improving the nutrition of this and then decided to make this business. She makes these incredible vegan cakes and this good for you popcorn. Her husband has, since, lost all of that weight. He’s now healthy and is park of the business, and they’re growing this. We have other food businesses that have started off at St. Peter and Paul. Chez Chloe’s for example, who makes these incredible lava cakes. She was awarded the Air France contract. Her lava cakes are now on Air France. There’s been so many fun opportunities that have happened for our entrepreneurs. Some of them have graduated and moved off, which is exactly what we want to see happen. We have one of them who has her bakery now and was able to move into her space. We have others that have looked for space on the Eastern Market and have recently found it. They’ll have like a little retail front on the front. We’re noticing around the food entrepreneurialism there’s a whole huge pipeline for food entrepreneurs. We started to look at the needs of those folks from the idea stage all the way to them finding bricks and mortar. What we’re noticing is that you come off of, maybe you have an idea somebody said to you that theses are the best pies, and you should do this for business, so now you’ve got an idea. How do you build a business plan? How do you know about the food business? Maybe you don’t have a college education or maybe you do, and it’s in something else, you’ve never run a food business. Where do you begin? Traditionally that place has been with Food Lab. They run a twelve-week program that they call Base. It showcases what a food business looks like from idea on. Elements that that food entrepreneur will need. With our partnership with Food Lab, they’ll say, “Okay, if you’re making this in your home kitchen, you need to get into a commercial kitchen,” and We will hand them off to Detroit Kitchen Connect. Where do you go from there as a food entrepreneur? There’s all sorts of wrap around services that you need as far as business planning and how to manage this growth. How do you scale up. We have another organization that we work with called Hopeful Harvest. That’s a step up of a processing center. They can do co-packing for you. They can help you scale up your recipe. They also, through a partnership with Eastern Market, we put in a bottling line there so we can do higher end production there. We really see even a bigger need there. More higher level processing equipment so that people can gradually move that product up without having to do this huge capital expenditures on equipment. They can get some sales going; they can start to build capital, then they can buy equipment. Now, maybe they’ve got equipment, they’re ready to buy equipment, but they can’t usually buy equipment and build out space. We really want to be able to add what we call white box space here, which is leasable food business ready space. That’s another project that we’re working on here in the market. We’re working on a 103,000 sq ft building. We have about 80% of that letters of intent of food business that want to go in there, but also, and we want to leave space open for these white box spaces. Anywhere between eight and ten of these space to allow businesses to graduate into those. They will probably be around 1,00 to 3,000 sq ft spaces. We want people to come in, be able to grow their business. And then, now that they’ve been able to invest in the equipment, in the product themselves, now we can generate more sales, now we can afford that bricks and mortar place. This is all adding jobs, adding economic activity. And keeping it in doing what the people of this district wanted, which is keep this an authentic working food district. While at the same time opening economic activity out to people from all sorts of different social, economic levels and providing that economic democracy here. That’s kid of our ambition; that’s what we’re trying to do. As I was telling you before, that we have these businesses that want to expand, if the whole system works right those businesses that’ve been in the shared white box space, as they grow we fill those in on the business that is looking to move and expand out. We keep this whole pipeline of people moving and keep that there. Romy: There’s so much exciting things happening. I feel like we’re keeping the culture of Detroit here, all this generational history is incorporated into the future forward movement of this, so it’s keeping the culture of food, access and all this that has been here for so long. I don’t want to say tradition, but the culture of it here it’s really encouraging all of this extra abundance. I feel because you guys are such good stewards, you could have quite simply taken that contract a long time ago that says, “Yeah, we’ll just manage it. Status Quo.” What’s coming to mind is, sometimes our libraries get that way. “We’ll manage it the way it still needs to be.” You guys took that, honored the parts that needed to stay, and really looked to the future. It truly is a 747 because it’s a massive operation and you’re learning how to fly, and I feel like you’re launching all these other jets at the same time. Christine: We just hired a new marketing director, and she has been walking around for the last week or so realizing just the magnanimity of the job that she’s just embarked on. Because it is so massive, because there are so many audiences, we have our chain consumer that comes down to the market on Saturdays. We have our farmers; that’s an audience as well. And our value-added food producers, that’s an audience as well. The merchants that are in this district, that’s an audience. Our funders, our granters, our people who donate to us. The suburbanites, the rural folks, the city of Detroit. All of it, they’re all messages, and we’re trying to say what we do to all these different folks to get a message across and it’s hard to get your arms around it some of the days because we are doing so much. Yeah, it under this umbrella of food and it could be under an umbrella of economic development, but it is a massive undertaking, and sometimes you’re in it, and you lose site of the bigness of it. It’s hard for me to explain to somebody that doesn’t live here or doesn’t work here. Eastern Market is like the happiest place on the planet on any given Saturday. It is a place where rural and urban and suburban all come together. Every ethnicity, every socioeconomic level. We come together to talk about and celebrate this thing that we all love, which is food. We like to work on food; we like to talk about food. Everything about it. It’s this great unifier and equalizer. To generate activity and buzz and excitement around it seems natural for us in this city, to get excited about food. Now, all these amazing restaurants are coming up here. I feel like it’s part of our renaissance or … I don’t even want to use that word because it’s little cheesy, but it is. It’s just something that is really happening here. All of these progressive thought leaders are coming to the city. Even the folks that have been here generation after generation, they’re just as much a part of it as well. Romy: The word that always keeps coming to my mind when I describe this to people, not from Southeast Michigan, I always think of the word village. Of all the places I have traveled around the world, even in very remote villages, it’s like a big village. People are helping each other, and when you’re walking around here, especially on one of those Saturdays, I can’t explain it, but you all feel like you’re related. You feel like you’re a family all coming to this big tradition, and there’s this almost unwritten understanding of the appreciation of what everybody is doing. Christine: I feel that too. I feel that we’ve all experienced the tough times in this city. I think we’re all gunning for it. I think that because we’re all gunning or it together that it’s another thing that unites us. I will say that in my time here, this city, I find it does easy to love, but she breaks you’re heart sometimes. I think that that is another part of our shared experience here. SHe’s an underdog, and we love her, and she’s fallen and we just all want to see her get back up. Romy: That’s such a good way to put it. That’s so true. You fall in love with people. I always like to say, “I fall in love with the faces, not so much the places,” because it’s the faces that make everything work. You are honoring that here. I’m going to have to come back because there’s so many things I want to say and touch with you. I think, hopefully, for you listeners, we’ve laid a foundation they’re figuring out how to make an enormous marketplace today in this modern day around food, helping entrepreneurs, continuing to educate. We didn’t get to it, but we’ll come back and do it some more. There are some amazing revenue models here. I don’t want to leave this conversation letting anyone think, “Gosh because it was all grant funded.” There is a lot of amazing revenue sources here that they’ve been thoughtful about honoring. Speaking about honoring, let me honor your time and thank you so much, Christine, for an opportunity to interview you and learn more about what the Eastern Market has been doing and what you guys are up to. I can’t wait to come back and keep tabs on the progress and do an update here. Thanks again.